Cottoy won in that category from a field of four, which also included Andre Creary of Jamaica, Kjorn Ottley of Trinidad and Tobago and Dalton Polius of St. Lucia, when WIPA held its Annual Prize Giving on Thursday, March 12, at the Hyatt Regency Hotel in Port-of-Spain, Trinidad and Tobago. 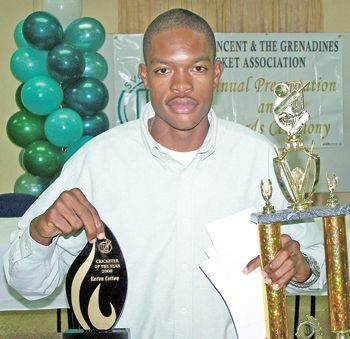 He rates the accomplishment as being superior to being named Senior Cricketer for 2008 at the St. Vincent and the Grenadines Cricket Association Awards Ceremony last December. Speaking to SEARCHLIGHT last Monday evening, Cotty said: âIt is a great feeling. I feel honoured to get such an award…. It shows that people are recognising you for your workâ, he added. Currently a student of the Division of Technical and Vocational Education of the SVG Community College, Cottoy said he went to function in the twin island republic not knowing what to expect, but enjoyed the chance to be in such illustrious company. Cottoy, 19, a right arm leg break bowler, had a stellar year in 2008, mainly at the regional Under-19 Tournament in Barbados. He was the leading wicket taker in the league format with 38 wickets. Cottoy was elevated to role of the Windwards Under-19 captain after not even being selected for the 2007 regional tournament. He also led St. Vincent and the Grenadines to the third straight title in the Windwards Under-19 competition in Grenada. And, even in his debut year at the St. Vincent and the Grenadines senior team, Cottoy was named Vice-Captain by the tour management, when the four-island Windwards tournament was held in Dominica last September. The Richland Park resident plans to work even harder, as he is already being monitored by regional cricket authorities. Cottoy is among several young players who have been centrally contracted by the West Indies Cricket Board. But it was dependable left handed West Indies batsman Shivnarine Chanderpaul who was adjudged International Cricketer of the Year on the night. It was the second successive year that Chanderpaul won the prestigious award. He was also the Test Match Player of the Year for his consistent batting in the middle order. For the top award, Chanderpaul beat off Ramnaresh Sarwan, Chris Gayle and Fidel Edwards. In the Test match category, his opponents were Gayle, Dwayne Bravo and Edwards. The other awards were One Day International Player of the Year, copped by West Indies captain Chris Gayle of Jamaica, with fellow Jamaican Nikita Miller, the First Class Player of the Year in the four day tournament.